So I’ll start off by officially announcing that we have moved to Florida. 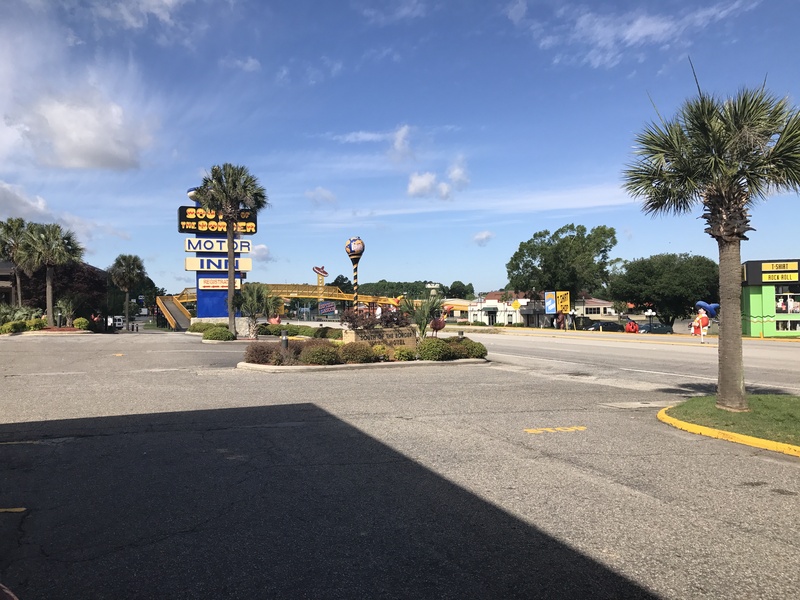 I think I have mentioned this in brief passing in some previous posts which also explains all the short trips to Orlando over the last few months. This was partly due to Family and partly due to work but it was a big move for our family and we are taking this new adventure one step at a time. Of course being in the Theme Park capital of the world is also going to help everyone with that transition. Anyways, we have been here about a month so far and still have boxes all over the place. 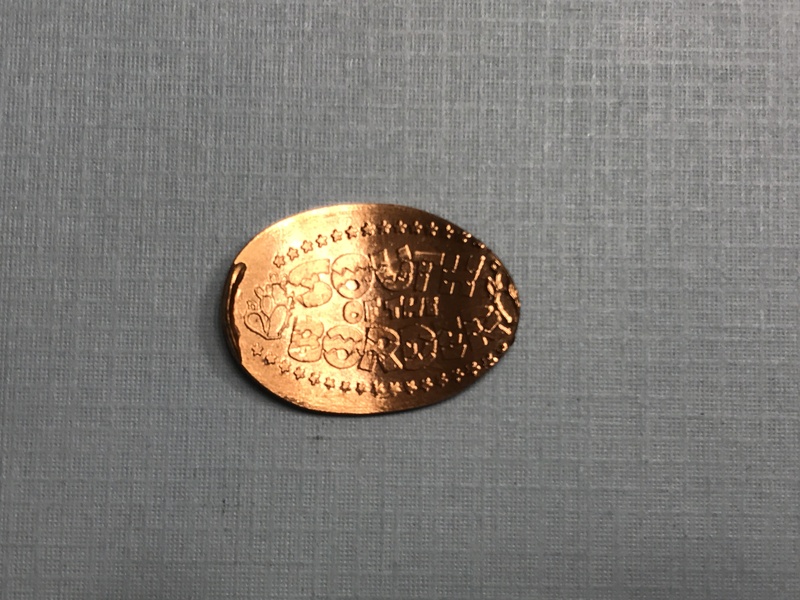 As I was going through some bags I found a pressed coin that I was able to press on our moving trip down to Florida. The first day we drove to North Carolina and stayed in a hotel. The next day we got up early and hit the road. By the time we crossed the border into South Carolina we were all ready for a quick bathroom stop. 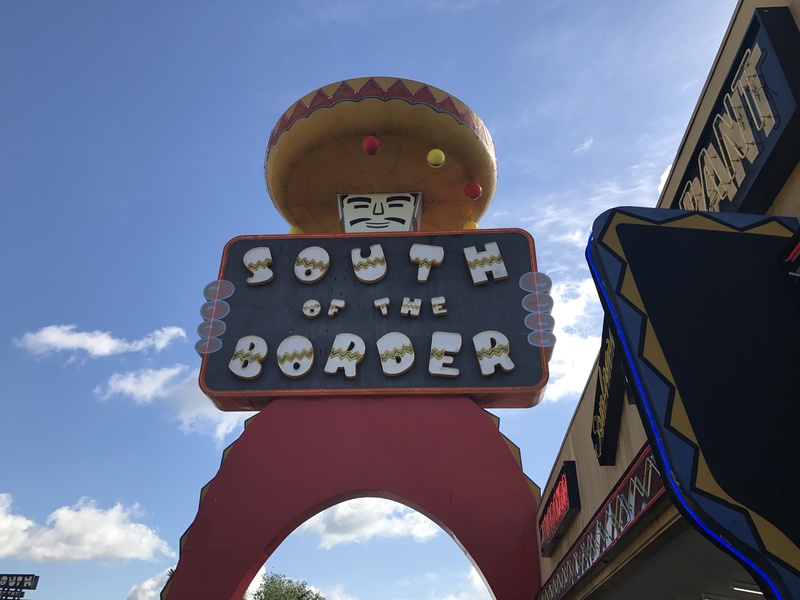 As luck would have it we had been seeing billboards for about 50 miles advertising THE MUST STOP PLACE South of the Border. We saw the exit sign and did as we were told. As you exit the highway you can this huge character known as Pedro showing the way. We pulled right in the parking area below this huge sign. It’s actually a very interesting area to wonder around. 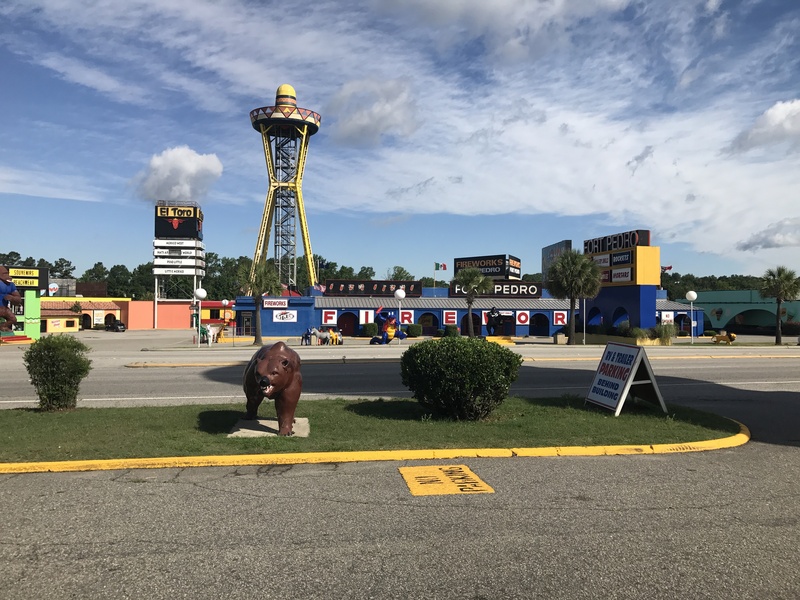 There are different stores, restaurants, a gas station, reptile museum, and a huge fireworks store if that’s your thing. The buildings, and colors of this place are very unique but interesting at the same time. 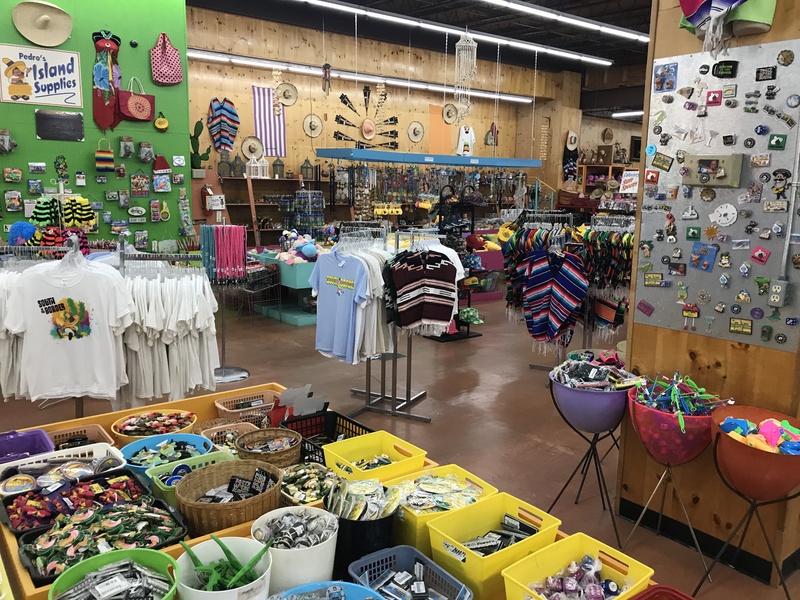 We didn’t want to spend too much time here as we still had a long drive ahead of us but we found the restrooms inside a building called Mexico Shop East. Of course you know the restrooms wouldn’t be right at the front but instead all the way towards the back. 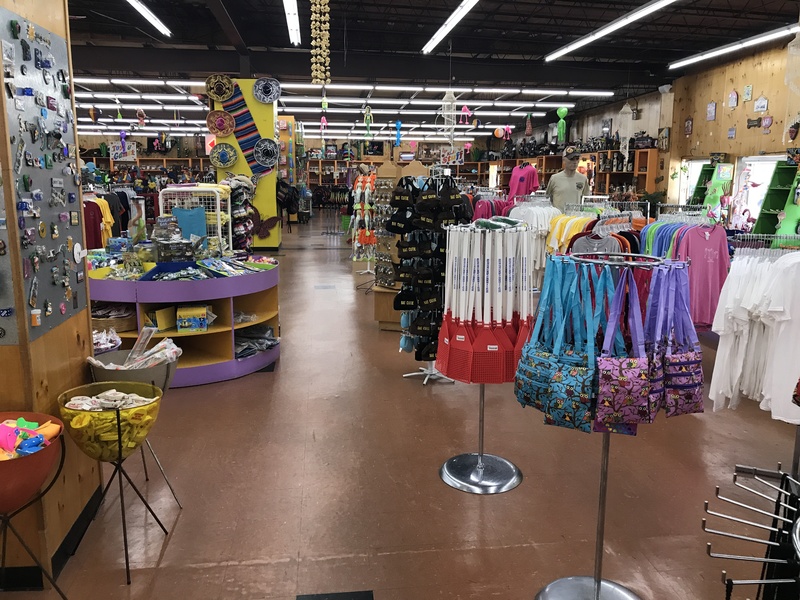 This way you can walk through the huge store of souvenirs and all sorts of crazy nick knacks. You can get carried away buying some of this stuff if you aren’t careful. My kids were in heaven with all the toys but we had very little room available in our car at the moment so we limited them to one small toy to keep them occupied for the next 8 hours. 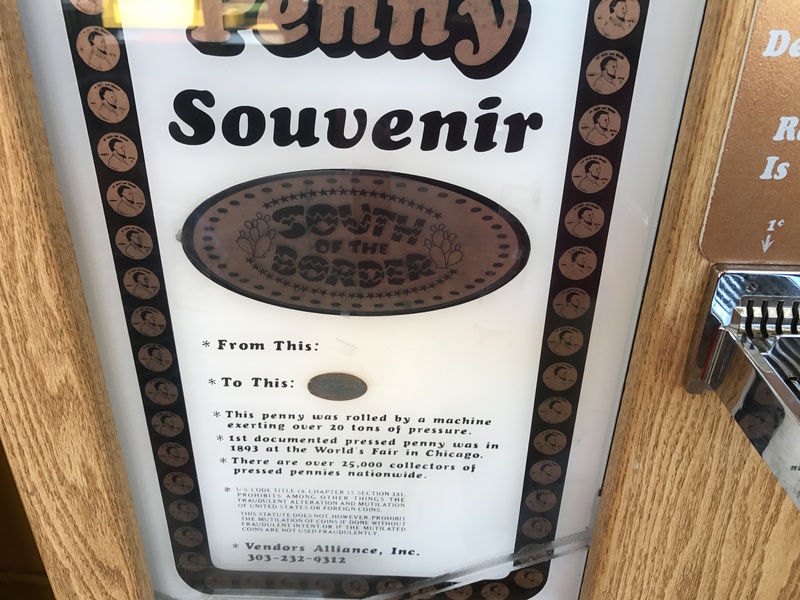 The penny machine that is located in this store is right inside the main door you enter when coming in from the parking area. It’s a 1 design electric press and still costs only 50 cents plus your penny. On the left is a close up of the marquee sign on the machine with instructions on how to use it. Since there is only one design you pretty much just put your coins in the slide and push it back. A few seconds later and your new pressed coins drops out the bottom. As you can see the finished coins did press a little short, but the design still came out pretty nice. 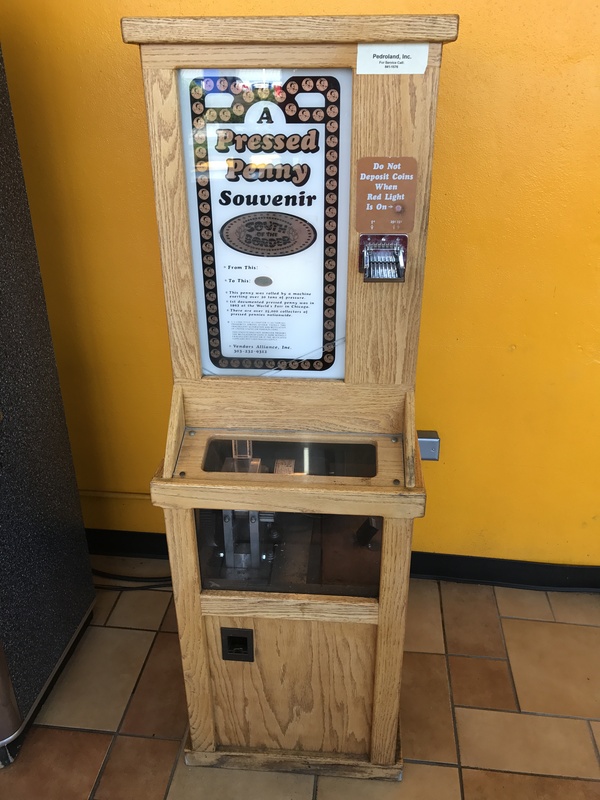 There are notes on pennycollector.com that there is another machine in one of the restaurants but it has the same design. I didn’t have time to try to find it to confirm but their website is usually pretty accurate in my experience. Thankfully I had some extra quarters and pennies stashed away in my car. I’ve said it over and over again you just never know when you will come across a machine you didn’t know about. After seeing the machine I went back to my car grabbed some change and added another cool pressed coin to my collection.